In October 2012, the Community Food Advocates held a dinner on the farm. Using local restaurants to supply the food, everyone enjoyed their evening on the farm. They changed it up in June 2013, and held a Family Fun Day on the farm. Families came from all over the area to visit the farm, pet the goats, see the chickens and visit the many vendor booths. Their was food and fun all around! The Bellevue Harpeth Historic Association held their fundraising dinner on the farm in June 2013. With entertainment by Les Kerr and Donnie and Ryan Winters. They also had Dr. Bill McKee was the guest speaker for the evening. It is a great location for birthday parties. After cocktails and dinner, a slideshow presentation is held using the white wall of the pool house to project photos of the birthday person! It's a great way to sit and enjoy the evening. The pool house is also used as a stage for a live band to entertain guests. Come and enjoy the farm where many music artists have been before you. Hank Williams Jr. filmed part of his "All My Rowdy Friends" video in the field that is now one of the gardens. The barn is still there and can be seen in the background of the Jim Varney scene. To see this video, go to www.youtube.com and search for "All My Rowdy Friends". 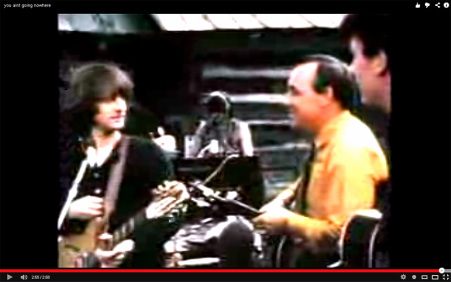 Earl Scruggs and The Byrds filmed their PBS segment for Earl Scruggs, His Family and Friends, in front of the log cabin on the property. The cabin and the swimming pool can both be seen in the background of the video. To see this video, go to www.youtube.com and search for "Earl Scruggs and The Byrds".